A look at the common allergies, their causes and effects, and how to minimise these by changing your eating habits. Asthma is a disease in which the airways are particularly sensitive to certain substances, and they become inflamed when they come in contact with these substances, thus causing breathing difficulties. Cancer seems to have affected almost everyone in the community either personally or through friends and relatives. There are many dietary factors which can influence your cancer risk, and we look at some of them here, as well as some measures you can take to minimise your risk of being affected. Such illnesses as Chronic Fatigue Syndrome and lupus can make you life seemingly unbearable. Changes in diet and exercise can help to make these illnesses more manageable. The incidence of diabetes is on the increase in Australia and around the world. You can read about the different types of diabetes and why it's becoming more prevalent in modern society. Also examines how you can monitor and control your diabetes. Eating disorders can be grouped under Anorexia nervosa, Binge eating disorder, eating disorder not otherewise specified (EDNOS), Bulimia and Compulsive eating and to a lesser extent yo yo dieting or cupboard eating. 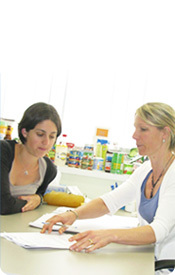 In treating eating disorders, a detailed dietary history is usually taken and then individual needs are addressed. Diets are designed that are suitable for the individuals. There are a number of ailments related to the gastrointestinal tract. The symptoms to many of these ailments can be reduced significantly by adjusting diet and eating habits. Heart disease is influenced by a range of dietary, hereditary and environmental factors. This covers some of the key areas with respect to heart disease. Hypertension or high blood pressure can be an indicator of more serious illness, but it may go undetected unless you get your blood pressure checked regularly. Some people are born with metabolic inadequacies. How do you know if your children are at risk, and what can you do to prevent further problems. Some medical conditions can be related directly to nutritional insufficiency. Read about some of the more common ones here. Osteoporosis used to be thought of as a disease of old age, but it is frighteningly becoming much more prevalent in the younger age groups. Read about the risk factors and what you can do to prevent yourself from becoming a victim of this ailment.